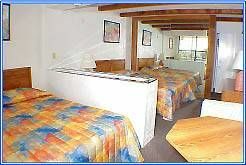 Is a timeshare resale or rental at Holiday Shores Beach Club calling to you? 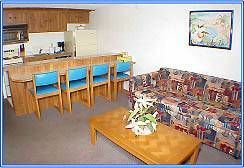 This thirty-two-unit timeshare vacation condo resort is situated directly on the white sand beach of Daytona Beach Shores. Although you are only minutes away from the attractions and entertainment of Daytona Beach (known as The World’s Most Famous Beach) this locale is the quieter part of the seashore where serenity and natural beauty prevail. Stroll the beach, ride the waves, or swim in the resort’s heated pool — it’s all just outside your door when you are a vacation owner at this Florida timeshare resort. With the sounds of the surf to lull you to sleep at night and sunrise over the Atlantic Ocean to greet you each morning (if you’re up for it), the time you spend at Holiday Shores will make you forget your daily routine and worries. As the rhythm of the waves rejuvenates your spirit and relaxes your body and mind, you’ll know that this is the way vacationing is supposed to be. And because you are taking advantage of the vacation hot deals available on the timeshare resale and rental market, your tranquil holiday won’t come with sticker shock when you get ready to head for home. Instead, you’ll take with you the peace of mind that comes from knowing you have a fabulous beach vacation and the opportunity to enjoy it again and again. 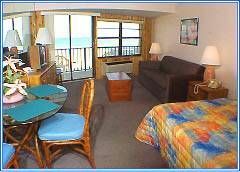 Whether your Daytona Beach timeshare vacation is planned for just the two of you or you need accommodations for up to six vacationers, Holiday Shores has a beachside condo that will suit your needs. Studio units sleep either two or three adults, have a partial kitchen that even includes a dishwasher, and have a full bathroom. One-bedroom units sleep either four or six (depending upon floor plan), have either a full or a partial kitchen, two televisions, and have one full bathroom. 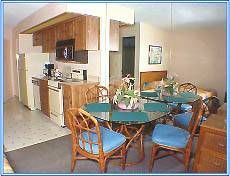 The largest vacation condos at Holiday Shores Beach Club are designed with two full bedrooms and two full bathrooms, complete kitchens, and a minimum of two televisions. Décor in all units is beachside casual, so put your feet up and enjoy your beach club escape at Holiday Shores. Contact Holiday Shores Beach Club Specialist Today!